How wealthy you are will, in future, depend more and more not on how well you do for yourself, but on how wealthy your parents were. That is the conclusion of a study into the growing importance of inheritance by the Institute of Fiscal Studies (IFS). Paul Johnson is the director of the IFS. We are all living longer, but the number of years we are healthy is not improving at the same rate. That is according to a report from the Academy of Medical Sciences which points out that as a result there is an increasing burden on the NHS. Dr Angela Donkin is deputy director at the Institute of Health Equity. Britain has a new man in Brussels. Sir Tim Barrow is to be the UK's ambassador to the European Union. So what do we know about Sir Tim? We hear from Sir Robert Cooper, a former UK diplomat and European Commission official who knows Sir Tim Barrow. People who live near major roads have higher rates of dementia, research published in the Lancet suggests. About 10% of dementia cases in people living within 50m of a major road could be down to traffic, the study suggests. Professor Martin Rossor is national director of dementia research at University College London hospitals. The astonishing number of murders in Chicago last year made news around the world and became an election issue. It was a rise of more than 50% on the previous year, many of them gang shootings. The Windy City had some good news last night however, with a major trial returning guilty verdicts against the leadership of a feared gang who contributed to that death toll. The core leadership of the so-called Hobos gang were found guilty of racketeering. Jason Meisner is a Chicago Tribune court reporter. Figures released today could show it has been a record year for car sales in the UK. The trend is explained by the increase in car leasing arrangements which offer consumers easier credit. We speak to Merryn Somerset Webb, editor in chief of Moneyweek, the personal finance magazine. The biggest technology show in the world gets underway today in Las Vegas. CES, which was first staged 50 years ago, has attracted nearly 4,000 exhibitors from across the globe. This year will see a range of products entering the home which claim to use artificial intelligence. Our technology correspondent Rory Cellan-Jones reports from the show. Life expectancy is increasing, but healthy life isn't increasing at the same rate, leading to a burden on the NHS according to a report from the Academy of Medical Sciences. Bob Lowe lives in Barton on Sea near the New Forest and is 95 years old. Dr Sarah Wollaston is MP for Totnes and chair of the Health Select Committee. Senior diplomat Sir Tim Barrow will replace Britain's ambassador to the European Union, who resigned unexpectedly just weeks before Brexit negotiations are due to start. Sir Tim, the former ambassador to Moscow who has previously served in Brussels, replaces Sir Ivan Rogers who resigned on Tuesday with an email which criticised the government's approach to Brexit. Does the speedy appointment help to ease tensions between politicians and the civil service, and what will his appointment mean for trade negotiations. James Landale is our diplomatic correspondent. We also hear from Lord Marland, chair of the Commonwealth Enterprise Council and a former trade envoy for David Cameron, and Lord Livingston, a Conservative peer, former minister for trade and investment and former chief executive of BT Group. A chance meeting between a spider expert and a chemist has led to the development of antibiotic synthetic spider silk. After five years work an interdisciplinary team of scientists at the University of Nottingham has developed a technique to produce chemically functionalised spider silk that can be tailored to applications used in drug delivery, regenerative medicine and wound healing. Dr Sara Goodacre is from the spider lab at the University of Nottingham. The government is being urged to ensure witnesses in the so-called "Trojan Horse" inquiry are not revealed. Several schools were investigated amid claims of a Muslim hardliners' plot to control them; known as the Trojan Horse affair. Those who gave evidence to an inquiry into the alleged schools scandal fear their identities may be revealed despite a promise of anonymity. The action comes after the witnesses received letters saying their interview transcripts would be passed to the lawyers of teachers facing tribunals. Liam Byrne is Labour MP for Birmingham Hodge Hill. British farmers grow less than they could, they cannot improve their productivity in the way American farmers can thanks to the EU's "insane hostility to innovation". 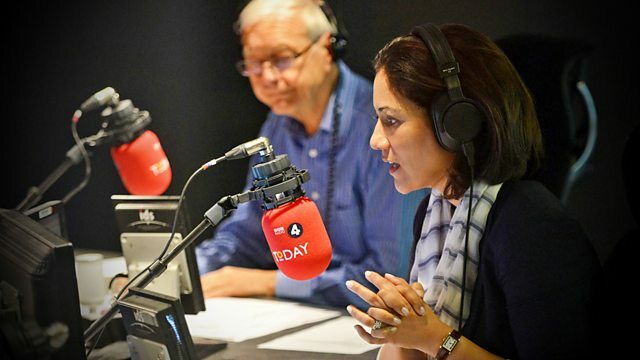 That was the claim made by the former Environment Secretary Owen Paterson on the programme yesterday, saying that he had recently visited the headquarters of chemical company BASF and heard their concerns. We speak to Paul Leonard, the head of innovation technology policy for BASF, and Molly Scott Cato, a Green MEP who sits on the Agricultural Committee at the EU parliament. Young people are ill-prepared for the digital world, in which they spend increasing amounts of time, according to a report by the Children's Commissioner. One of the main findings is that children do not understand the complicated terms and conditions of social media sites and therefore do not realise when they are giving away their data, images and privacy online. Anne Longfield is the children's commissioner for England. Senior diplomat Sir Tim Barrow will replace the UK's ambassador to the EU. The former ambassador to Moscow who has previously served in Brussels, replaces Sir Ivan Rogers who resigned on Tuesday with an email which criticised the government's approach to Brexit. We speak to Mats Persson, head of international trade at EY and formerly David Cameron's special adviser for Europe. Research by the Institute for Fiscal Studies suggests that inheritance tax is set to cause deep wealth inequality in the future. It says younger generations are likely to inherit much more wealth than their predecessors with the well-off across the generations set to inherit the most. Polly Toynbee is co-author of Unjust Rewards, a book about inequality, and Kate Andrews is an expert on pay regulation at the Institute of Economic Affairs. One big question about one big story from the news - and beyond - every weekday. An activist based in Raqqa, Syria describes the horror of everyday life in the city.